I had the chance to try the ramen at AGU this past weekend and in conclusion, it was delicious! It’s located across the street on the Diamond Head side of Old Stadium Park at the St. Louis Alumni building. There’s plenty of parking out front and ample street parking too. The restaurant is small but clean and inviting. They offer two types of broth: tonkotsu which is a milky soup made by simmering pork bones for hours and hours and hours. There’s also a jidori chicken based broth which I’ll try next time which is a clearer, lighter broth. 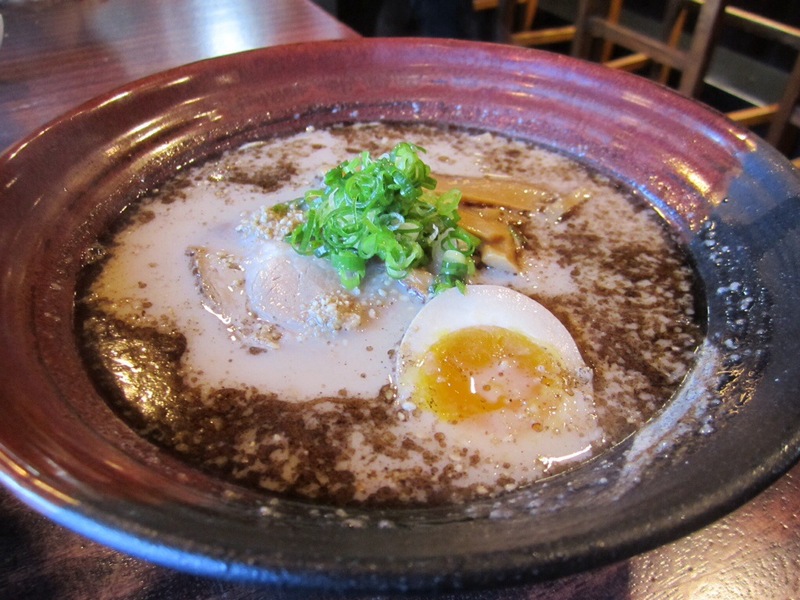 Here’s the Shio (salt flavor) Tonkotsu Ramen ($10.75). The noodles are straight, thin Hakata style and it’s topped with 2 slices chashu, menma, green onion and aji tamago (seasoned egg). 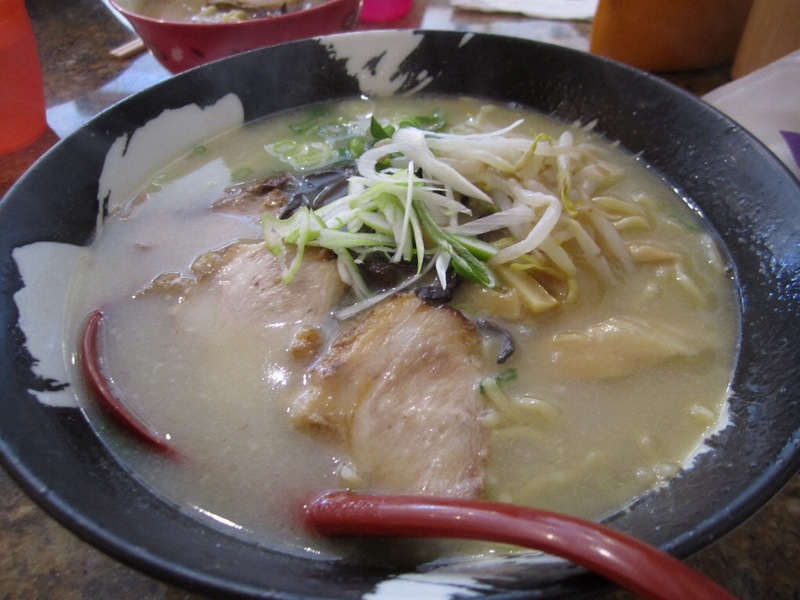 The soup is so yummy, true tonkotsu flavor, and the thin noodles absorb the flavor so well. I was in heaven! How I missed this kind of ramen! D got the Kotteri Tonkotsu ($11.75) aka the fatty version with garlic and seabura (melty bits of pork backfat) which was delicious as well. The regular tonkotsu is rich and satisfying enough though, so I think I’ll stick with the regular tonkotsu in the future instead of the kotteri. My only thought was about the toppings: I wish they had some benishoga (pickled ginger) and takana (pickled mustard cabbage) on the side! These condiments definitely serve a great purpose in cutting through the richness and monotony of the soup and are a must have with Hakata ramen. I can’t imagine the restaurant (not to mention Japanese customers ) would allow this kind of omission. I wonder if it’s available upon request? Next time I’ll ask but I’m gonna sneak some pickled ginger in my purse just in case. 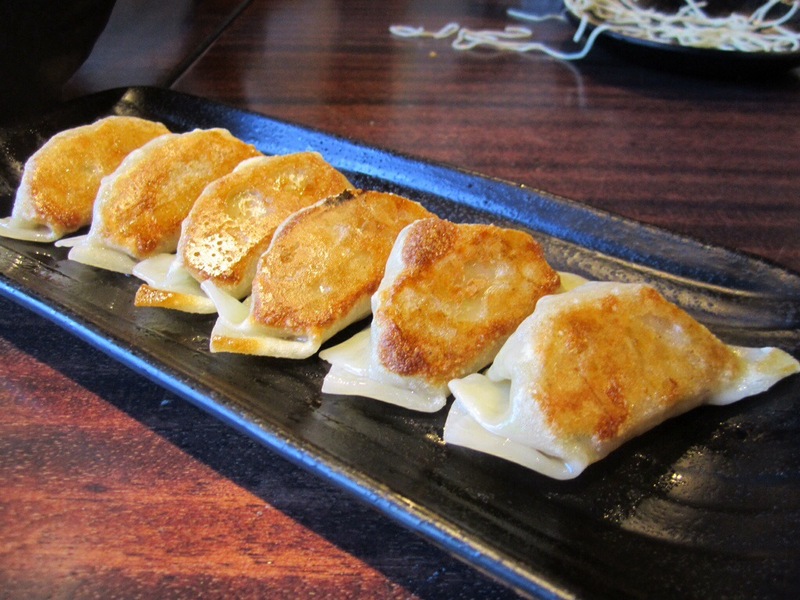 Oh here’s the Gyoza ($5.25/ 6pc) which could have tasted like cardboard for all I care – I was already a loyal AGU customer at this point. By the way it didn’t taste like cardboard, it was good. 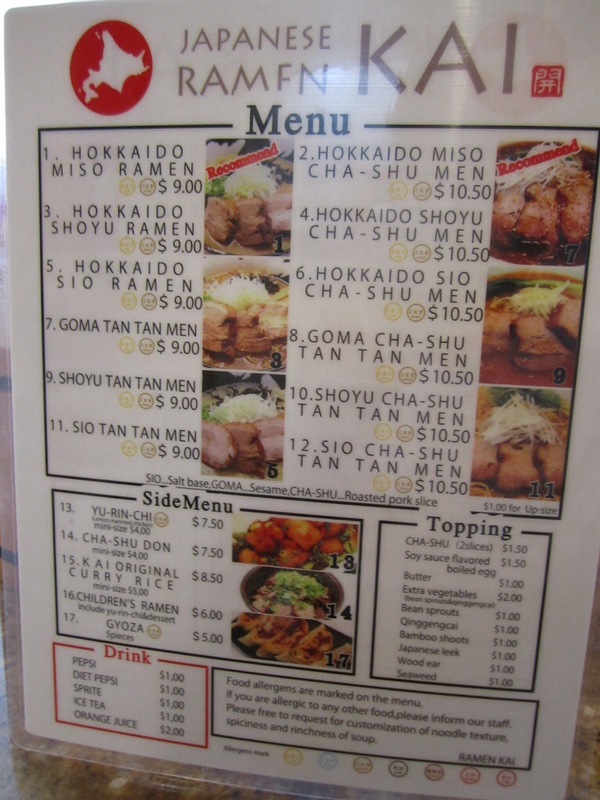 In short, this is the only ramen place I know of on Oahu that serves a tonkotsu soup of this quality and the thin straight noodles that I prefer. So as long as I can smuggle in some pickled ginger I’m coming back again and again. MENU: available on their website. P.S. Taro, your ramen is of course still the best. And not just because you’re my brother. My sister and I both got Shio Ramen ($9.00). Nice looking bowl topped with bean sprouts, kikurage, green onions, menma and three slices of delicious melty-soft chashu. 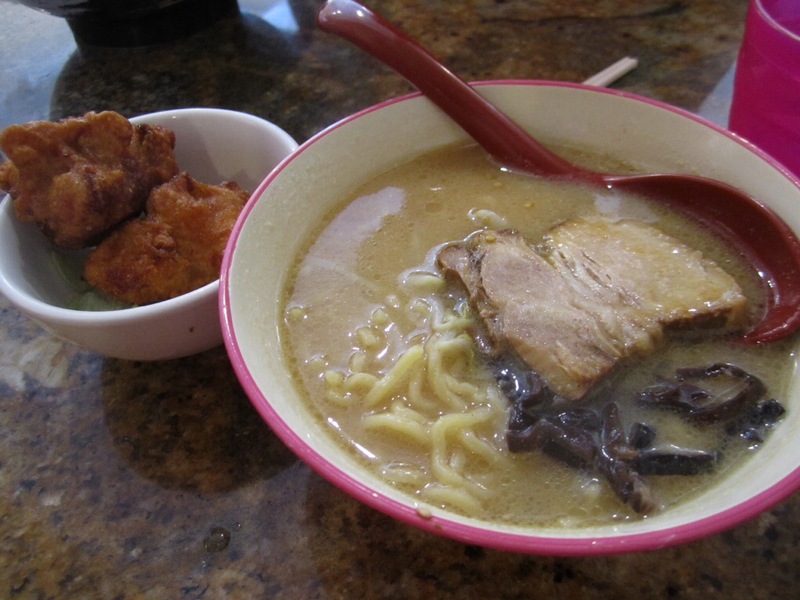 Kid’s Ramen ($6.00) which comes with 2 pieces of their Yurinchi Chicken (karaage) and dessert (a bag of fruit chews). We ordered this in miso flavor for taste comparison. Yummy soup, nice portion size, but I prefer my noodles thinner. I would surely come back though, alternating between Santouka and here. I’m not entirely sure what the characteristics of “Hokkaido ramen” are, since even within Hokkaido there are several types of ramen. My impressions growing up were that Hokkaido was famous for miso ramen, or for ramen topped with butter and corn. 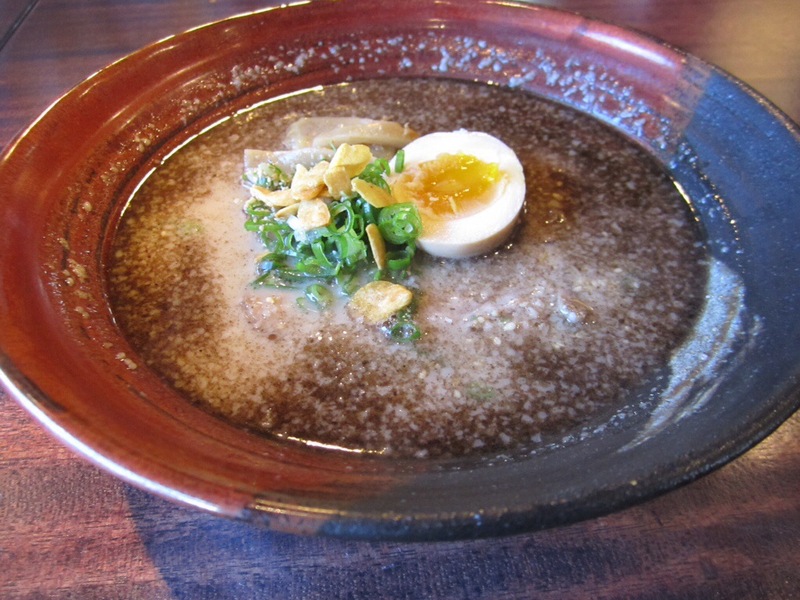 Based on dining at Kai and Santouka, the similarities between the two are that diners can choose soup options in shio, shoyu, miso and spicy tan tan, the broth is mainly tonkotsu based and on the rich side, and noodles are medium to medium thick wavy. 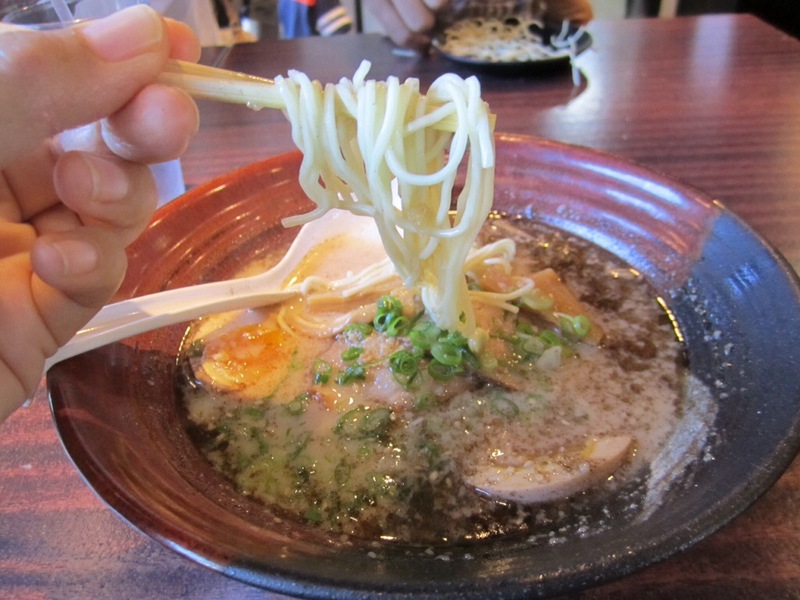 I wonder what makes Hokkaido ramen especially appealing that two of the recently opened ramen shops are Hokkaido ramen? 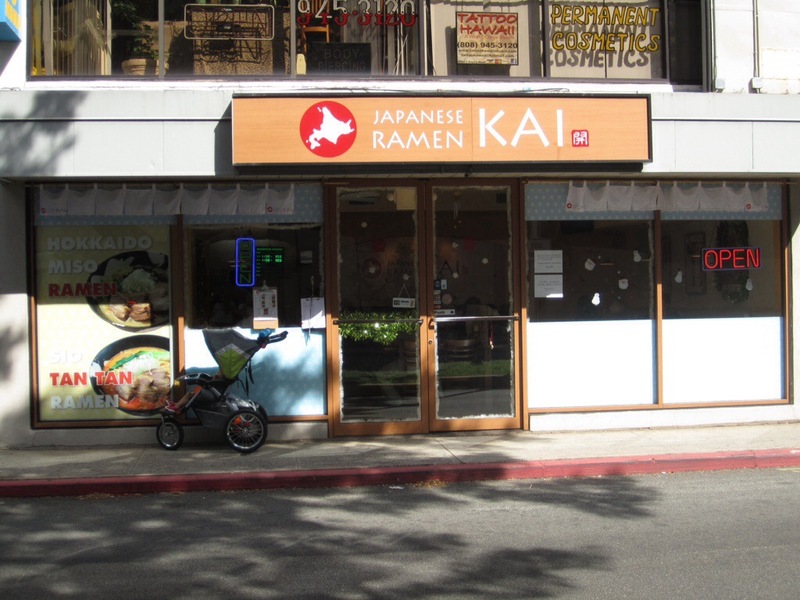 Is it a better match for the Hawaii market over the other delicious varieties of ramen from all around Japan? The soup is delicious, but I prefer even richer (kotteri) and with thinner noodles. The bigger question is why there is no Hakata ramen joining the race? 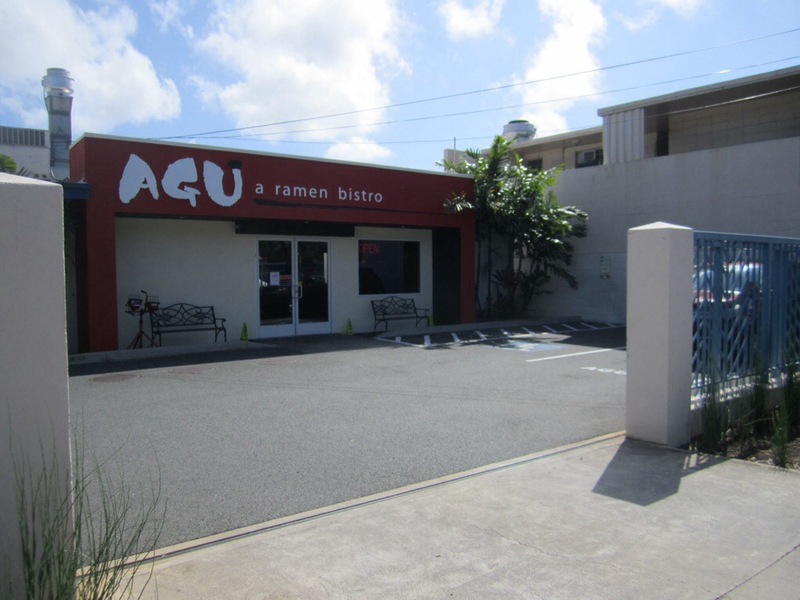 …Until my sister told me of a place called Agu in Moiliili that is supposed to be Hakata style. Anyone tried it? I’m so there the next chance I get!! !